Marshmallow Fluff and lots of peanut butter. But Bostonians may not know that marshmallow cream actually originated right here in Somerville, Mass! In 1917, Archibald Query went door-to-door to sell the gooey treat made in his Somerville kitchen. A few years later, two enterprising WWI veterans bought the secret recipe for $500, and moved the operation to Lynn. Good management and even better marketing made the Fluff business a sweet success. Maybe it is mostly air-whipped sugar and not real marshmallow (a plant that actually grows in marshes), but the squat white-and-blue jar of Fluff has been present in cupboards across the region for more than three-quarters of a century. So it's no surprise that it generated quite a controversy in recent years, when a state senator tried to ban Fluffernutter sandwiches from the school lunch program. Health benefits aside, nobody can deny the iconic cultural status of marshmallow fluff. Certainly not after attending the Fluff Festival, which is was held today in Union Square. Bigger this year than ever before, the festival really celebrates the many diverse functions of marshmallow fluff. A Fluffernutter race... the blindfolded contestant was required to feed the fluffternutter sandwich to his/her partner. The first sandwich eater to sing the fluffernutter song was the winner. And an excellent performance by the Flufferettes! You go girls! Show us your fluff! Cambridge, Mass - I'm pretty sure this is the first time I ever celebrated the autumnal equinox. But really, we spend much of the year looking forward to summer, then we luxuriate in the long sunny days. Why - when it's time for the seasons to change - should we let it slip away without a farewell? I suppose that is the reasoning behind RiverSing. It's basically a gigantic sing-along on the banks of the River Charles, led by musicians from the Revels. What an awesome way to bring the community together to sing songs that honor the river and the changing of the seasons. The event kicked off in Winthrop Park in Harvard Square, with face-painting and stilts-walking. Then the Second Line Social Aid and Pleasure Society Brass Band led a procession down to the river, followed by hulahoopers, dragon puppets and hundreds of people. The Revels performers took to the stage near the Weeks footbridge, while the audience was invited to sprawl out along the river with blankets and picnics. Volunteers passed out lyrics so everybody could sing along to folk favorites like The Water is Wide and Michael Row the Boat Ashore. (Not all the songs followed the river theme, but many did.) One song was written especially for this event - Sing to the Charles - a sort of ode to Boston's beloved waterway (not the first of course - but Dirty Water by the Standells was not included in this particular event). The crowd favorites were the ones that everybody knows. It's pretty amazing when hundreds of voices join together in spontaneous celebration of something so simple as a seasonal change. A bell was rung to signal the setting of the sun, and we said goodbye to summer. The sky was dark by the time the grand finale took place. River Hymn is a call and response between the singers on the shore and a saxophone player on a barge in the middle of the river. The barge was decked out in lights, with a sun and moon on either end, and sax-player Stan Strickland sounding the melody. The barge circled around three times, as the singers and the sax called back and forth to each other. Beauty is before me. Beauty is behind me, above me and below me. Somerville, Mass - I am so proud of my fellow countrymen and women. According to a poll conducted by Expedia and published by the BBC, Americans are #9 on the list of the World's Best Tourists. According to the article, Americans are most likely `to swallow their pride and order... in the local lingo.' Initially I was surprised by this assessment, as Americans are notoriously bad at learning foreign languagues. It just goes to show that you don't actually have to speak the lingo to please the locals, you just have to be willing to `swallow your pride' and give it a try - even if it means an oral butchering. The article goes on to say that `US tourists also get top marks for generosity, as the biggest spenders and tippers.' This is directly related to the fact that we pay barstaff and restaurant servers below minimum wage in our country, which means that a 15-20% tip is practically mandatory. In Europe (and other places), restaurant workers actually receive a living wage from their employers, so the guests tip very little, if at all. Such habits are hard to break. On more than one occasion, I have secretly supplemented the stingey tip left by otherwise generous European dining companions (in the US). Indeed, I feel like I may have single-handedly skewed the numbers on this poll, since I tend to overtip pretty much everywhere I go (ever since my days waiting tables and earning below minimum wage). At least it seems to be appreciated by folks in the local hospitality industry. What really concerns me is this bit about being poorly dressed. My fellow Americans, let us support President Obama in his efforts to improve America's global image. The single most effective thing we can do is to stop wearing sweatshirts and sneakers on the streets of Paris and Rome. Let's throw out our fanny packs! Let's show the rest of the world that we have pride in our nation - that our pockets are not only deep, but they are also well-stitched. Yes we can! Somerville, Mass - Apparently, the rainy summer delayed the berry season in New England. I read about it in this Boston Globe article, and then I witnessed it first hand, when the raspberries that grow along the side of the pink house burst forth into berry-dom. There were a few berries earlier in the summer, but not enought to get excited about. Indeed, I had sort of given up on them. Now this. Funny thing about these raspberries... they used to belong to our next-door neighbors. But when new neighbors moved in, they tore everything out of the yard. Everything. The blooming lilac in the front was razed "to let more light in"; the gorgeous garden in the back was completely pulled up "because the dog will dig it up." I have no idea why the raspberry bushes were cut down to nothing - probably because the new neighbors had no idea what they were. Fortunately for me, a few delinquent branches had started to sprout up on our side of the fence. So we let them spread. There was not much to show for it last summer, but this year - come September - these branches were laden with tart juicy razzmataz. I had so many berries I decided to put the ice cream maker to work again. The recipe I used came straight from a website called Nibbledish, so I won't reprint it here. But I urge you to try it. I did have the idea that I should share some of the ice cream with my neighbors; but it was gone before I had the chance. Boston, Mass - Mom was in town for the weekend, so we went to check out the new Marine Mammal Center at the New England Aquarium. First of all, can I say that it's a little bit of an exaggeration to call this the "Marine Mammal Center." It should more apropriately be called the Fur Seal Center, because that's who is swimming around the new fancy digs overlooking the Boston Harbor. Sure, there are a few fun facts and photos about polar bears and walruses, but the only animals you can see live and in action are four fur seals: Ursula, Cordova, JD and Isaac. Don't get me wrong, the seals are charmers. It's worth catching the twice daily demonstration, when trainers show off their skills (mostly waving and otherwise flirting with the crowd). This is when you can see Cordova doing an excellent imitation of a harbor seal (which slinks along the ground like a worm, instead of propping itself up on its fins like fur seals do). And when the show is over, watch for Ursula doing a run and slide into the holding room pool. Even if you can't catch the show, the seals are pretty entertaining. Cordova is the real crowd pleaser, climbing up out of the water to look at her visitors, then opening up her mouth and letting out a reverberating shout. This soggy little creature really does sound like a mad man yelling at the top of his lungs. To the endless amusement of the crowd. 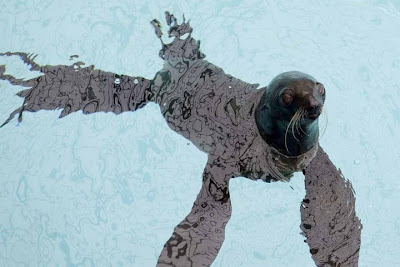 One of the best things about the new Fur Seal Center - er, Marine Mammal Center - is that it has opened up this stretch of the waterfront to the public. There is a lovely vista from the inside of the aquarium (which I'm sure the seals are enjoying), but the boardwalk has been extended so it circles around the aquarium, allowing everyone to appreciate the view. Finally, the aquarium is taking advantage of its fantastic setting by the sea! 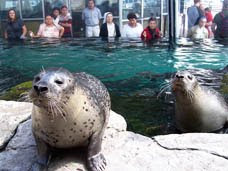 By the way, the harbor seals are still hanging out in their outdoor enclosure in the front of the aquarium, which means you can visit them without paying for admission. If you happen to be downtown in the evening, it's always fun to stop by and see what the seals are up to. They are usually surprised and excited to see you at that hour! Photos and video courtesy of the New England Aquarium. Somerville, Mass - I know, I know, I know. I know this is supposed to be a travel blog. But here I am with my domestic bliss, writing ice cream recipes and film reviews. What gives...? So, um, I have a little confession to make. The truth is that I'm not planning on doing any traveling for the next four months (!) Holy smokes, I have to write that again so that it sinks in... I'm going to be sitting tight right here in the pink house until the end of the year. I needed a little break from the guidebook gig, so here it is: four glorious months with nothing to do except make ice cream and go to the movies. Brushing up on my Portuguese. In anticipation of an upcoming assignment in Brazil, I will be switching languages once again. Soon there will be Portuguese swirling around with the Italian and Polish. Actually, the Portuguese will probably push the Polish right out of my brain. And let's face it, the Italian is long gone. Oh well, the important thing is that I'm going to Brazil this winter and that I'm going to be able to talk to people while I'm there. Tudo bem. Attending a Vipassana meditation retreat. Inspired by Elizabeth Gilbert and encouraged by a few experienced friends, I signed up for a 10-day retreat at the Dhamma Dhara retreat center. I will be spending 10 days in "Noble Silence". That means no talking - I can handle that - but it also means no reading, no writing (I know you will miss me), no music, no nothing. Just meditating and listening to your breath. I'm not really expecting a dramatic personal transformation, although some people claim it is a life-changing experience. That said, I am curious about how this age-old technique will allow me to "see things as they really are", which is what Vipassana means. Considering it is really a process of self-observation, it could get ugly. Dear readers, do not be alarmed. Just because I'm not going to be traveling, does not mean I won't be blogging. I'm sure I'll have countless entertaining and enlightening thoughts to share with you about above referenced experiences (as well as recipes, movie reviews, etc). Please don't go away! Write without pay until somebody offers to pay. is a writer and photographer who blogs about food and adventure around the world. She has written guidebooks about Belize, Brazil, Costa Rica, Morocco, New England, Poland and Russia for Lonely Planet.